Follow the link below to view a plan in the form of a photo montage showing the where ECC proposes to build 500 dwellings. Where official figures have not been available densities have been estimated from plan areas, and counting dwellings.In this case, density is quoted as “about”. Loram Way and spur roads have a density of around 28 dph. 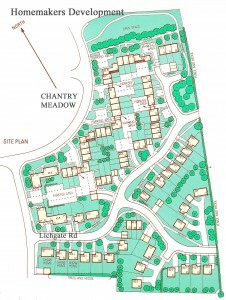 A typical area of mixed housing between Chantry Meadow and Pulpit Walk has a densirty of around 36 dph. Housing immediately adjacent to the “developable” fields, bounded by Lichgate Road and Steeple Drive has a density of about 24 dph. Thursby Walk (Chancel Park) has three storey town houses and four storey apartment blocks. The density appears to be over 80 dph. Newcourt off Topsham Road has an average density of 50 dph (45 to 55dph) , with long streets of three storey housing. This is a large development with little adjacent existing housing, and is in part on previously developed land. 500 house development, over 10 hectares, is a density of 50 dph. Although the Powlesland Road housing appears to be of similar density to the proposed development, it is a small discrete development that does not impinge adversely on the rest of Alphington. The location is semi commercial, being adjacent to Marsh Barton. That density translated over 10 times the area would certainly affect the village character. 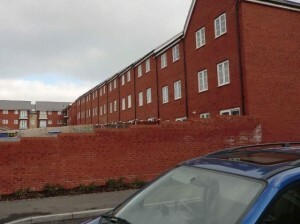 Given that the core strategy requires new development to be sympathetic (at least on the periphery) to adjacent existing housing (at about 30 dwellings to the hectare), this could mean density at the core of the development exceeding the higher Newcourt densities where the housing is up to 3 storeys high. The character of the area around the proposed Alphington development is quite different to the developments at Newcourt and Clyst Heath. Almost half of the perimeter of the proposed development has housing at around 30dph or less, the rest is presently fields. The landscape is more undulating and is much more rural in appearance. If the government guidelines (see below) are applied, a maximum density of 30 to 35 dwellings to the hectare would seem to be appropriate for the location of the proposed development. 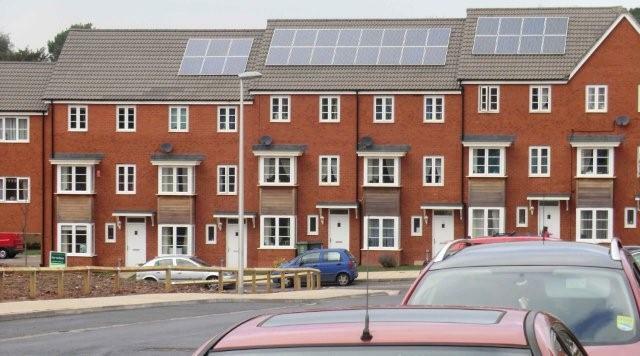 2.16 PPG3 requires local planning authorities to avoid developments which make inefficient use of land and to aim for a density of between 30 and 50 dwellings per hectare net (12 to 20 per acre). 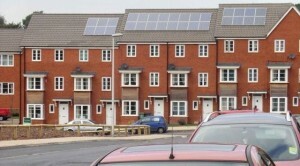 2.17 The density of any new housing scheme will in part depend on the characteristics of the surroundings area. However, whilst the authority accepts the justification for making best use of land within the existing urban areas, this should not be at the expense of a detrimental impact on amenities or the creation of environments, new buildings or developments that do not harmonise with their surroundings. iv. The wider visual impact of a scheme. Both the Teignbridge and Exeter proposals will generate significant traffic. Residents in the proposed new housing with Alphington will most likely use Chudleigh Road through Alphington to get to the city centre, with ramifications all the way to Exe Bridges. T junction Chudleigh Road. This is difficult and dangerous at peak times at present, will get worse. Chudleigh Road through Alphington will get traffic to and from Teignbridge DC new school(s) on Chudleigh Road. Roundabout at Devon Hotel will experience much more traffic, and it will be even more dangerous to exit from Alphington along Dawlish Road. Existing estate roads may become busier, with implications for local children. T junction at Ide Lane carries school traffic, and will become much more dangerous. The road infrastructure cannot be improved substantially. Think Church Road, Alphington Road, Alphinbrook road, Bad Homburg Way, Bridge road, access to A38. If these roads could be improved they would have been already. Short of bulldozing one side of Alphington road or concreting over the Exe then the traffic flow will not improve with the current level of traffic, let alone increased traffic. The A bus will not be convenient for many residents of any new development within Alphington, and if the route is extended, journey times will be even worse than at present. For the new Teignbridge development, there will be the option of using existing buses between Exeter and Newton Abbot, Torquay, Plymouth etc but at peak times these are likely to be full. The Teignbridge plan envisages transport links between the Matford development and Cranbrook, which is sensible, but would no doubt require significant investment in infrastructure, money which is unlikely to be available. Alphington is set in an undulating landscape, on the edge of an area of considerable landscape value, much of which will be obscured by new development. Many existing residents along the long boundary of the proposed 500 house development will have significant reduction in amenity. Existing properties adjacent to the developable fields have mature trees that could be affected by adjacent development. Recent and current developments in the City include three storey town houses in long rows, and also four storey apartment blocks. Three storey town houses are not suitable for elderly residents. Because of the visual impact, this type of development is only suited to former industrial or commercial areas, or large areas of flat land. Although there are one or two three storey blocks of housing in Alphington, near or on Chudleigh Road, these are of pleasing appearance, and at the village centre. Large areas of high density housing may lead to social problems. The core strategy states “The development of 500 new dwellings would result in significant additional pressure on existing facilities. Contributions towards the improvement of existing educational, social and community facilities, will be sought where no facility is required on site.” From whom will contributions be sought and what safeguards are there that these contributions will be forthcoming, and will the amount be sufficient? The core strategy refers to the Alphington development as being in an urban area. Probably most residents would class it as suburban or semi-rural, particularly based on the area centred on the church. Unfortunately all the parameters used by the city council are based on urban development. There is no place in Alphington where you are not a few minutes walk from the countryside, including out towards Newbury fields or the flood relief channel.